The Place I have been checking out quite a number of new cafes this year, which is not quite the norm for me from the cafe fatigue I have had. Bearded Bella is one new cafe which only soft opened early this year along Craig Road, located close to another new Tibetan inspired vegetarian restaurant Ganglamedo Vegetarian Cuisine. The concept of Bearded Bella is inspired by the Melbourne cafe culture, which the owners have experienced and are personally passionate about. The space of Bearded Bella is in a unique shophouse location in the sense that there is an alfresco courtyard seating area at the front of the cafe. The interior takes on a cosy look, dotted by pink cushions and bits of natural light from the translucent roof. The Food The menu offerings are robust and varied, including a good mix of desserts by their in-house pastry chef. For a cafe of its scale, it is also interesting to note that it roasts its own beans, with an inclination towards more fruity notes at the moment. For a start, I had the Flat White which boasts a slightly fruity note. The flavour is intense yet well-balanced and relatively easy to drink. One of the small plates I had was the Devilled Eggs (S$10), which comes with four egg yolks. The yolks are soaked in miso and topped with parmesan crisp, where the latter lends much of the flavour here. For mains, I recommend going for the Pigs & Eggs (S$24), a combination of slow cooked prowl jowls, green hollandaise, poached eggs and pickled daikon on baguette. The pork jowl is interesting deviation from the usual thinly sliced version, which comes in the form of curled bacon-lookalike pork jowl instead. The green hollandaise sauce can’t be discounted as well, which is made from spring onion extract and lends a good flavour to the eggs. The other main I tried is the Fowl Play (S$20), which is essentially crumbed chicken thigh with roasted cauliflower on charred miso corn. It is very easy for the chicken thigh to be too dry here, though it managed to retain some moisture in the meat here. It is best to have it generously with the charred miso corn here, which is quite creamy and rich. 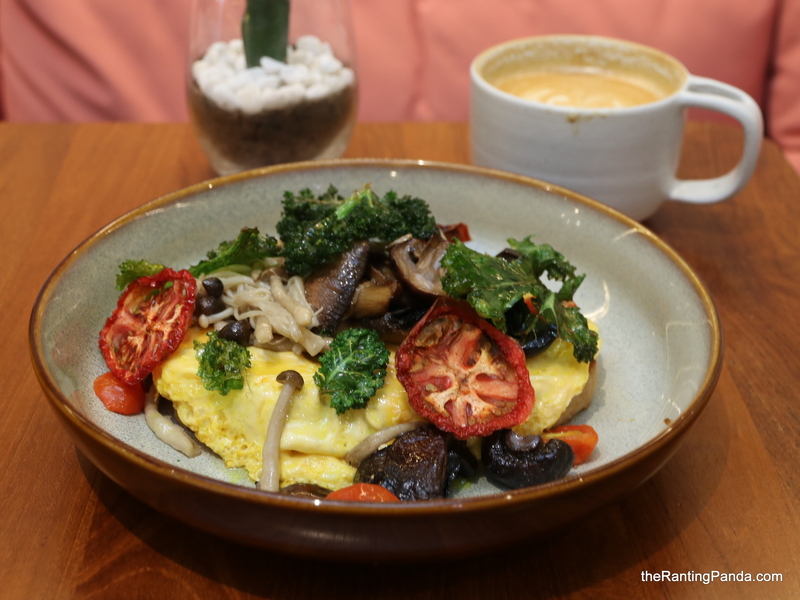 Alternatively, one option on the menu which can’t go very wrong is the Spiced Scrambled (S$18) which has two of my favourite ingredients – scrambled eggs and mushrooms. The crispy kale and hints of black truffle oil also add some good balance to the dish. If you are tossed between savoury and sweet, the Pain perdu (S$18) or French Toast is worth trying. The homemade brioche here is pan-fried, complete with pink guava compote, vanilla bean ice-cream and cardamom. The portion is really huge, and I think it is good to share even among three people as a dessert more than a savoury dish. The brioche texture is good, and the mix of ingredients work from an aesthetic and taste perspectives. Rants The idea of an outdoor courtyard sounds dreamy yet not very welcoming in Singapore’s weather, especially in the day. Cool evenings are probably the best bet if you fancy some alfresco fairy light ambience. Will I Return Again? It’s great to see a cafe which tries to differentiate itself from the other strong players in Singapore. The food quality at Bearded Bella is above average by cafe standards while the space gives me the laid-back vibes. There is also dinner service here run by a different culinary crew, with a different menu from brunch. If you are looking to check out a new cafe this year, this space at Tanjong Pagar is worth stopping by. Make your reservations instantly at Bearded Bella here.